Evening all, and Happy Father’s Day! Hope you all had a nice day with your daddies! We had a yummy roast dinner and chilled out, then me and Dan went out for a nosey round some shops this afternoon. What have you all done today? As promised, here is an outfit featuring my new charity shop find. 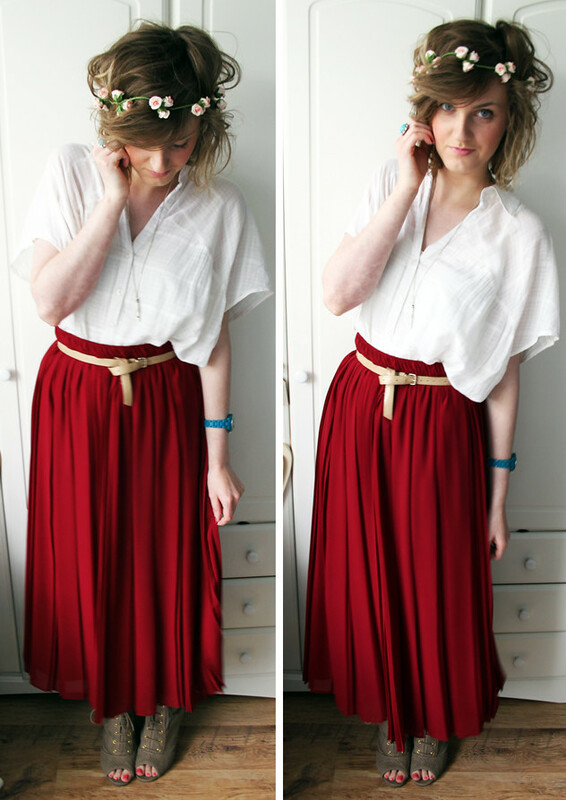 If you read my last post, you’ll know that this gorgeous pleated skirt cost a mere £3.00 from my local charity shop! Oh how I love a good bargain! Also, I wanted to let you know I’ll be starting a new feature called ‘Sitting Pretty Loves’ where I’ll show you something I am loving at that time. It could be anything from a particular garment, a whole catwalk collection, interiors, shops…. anything! So do keep your eyes peeled for that. Oh, and I’m going to extend the 50% off code for my shop for another day, so until midnight on Monday you can get everything for half price using code FLASH50 over at Sitting Pretty Vintage. PS. I’ve entered a fab competition over at StyleClone where a pair of Havaiana wellies is up for grabs! They will be perfect for the festival season, and I’ve got my eye on a pair for camping too. Be sure to enter here! "THRIFTY FINDS (PLUS GIVEAWAY WINNER)"
your hair looks so lovely here! Love that ring of roses sitting on your head! The skirt is fab too. Ooh, that is a lovely skirt! Was it a Preston charity shop or have you left for the summer? Your new feature sounds awesome! Love this outfit, the skirt is gorgeous – if only i could find such things!